Yesterday's writing experience was a smashing success - but not exactly in the way I had planned. I had wanted to start a new novel. I was thinking historical romance, despite the fact I've always been nervous about the vast amount of research involved. So I plotted out a fun kidnapping story set in the 1820s, but when I started trying to write it I just couldn't. Every second I was going - okay, what would his title be and how would he be addressed? What would she be wearing? Do they even have such and such in England in this time period? And so on... so once again I shied away from the historical romance novel. Instead, I figured out an exciting plot set in contemporary America. I wrote about 4 pages (yup, 1000 words) of plot, although I don't know how it ends. I mean, it's a romance novel so of course they get together in the end, (oh no! Spoiler!) but I've created a situation where they have every reason in the world to hate each other, so it's going to take a bit of thinking to make it so they can go from hating each other to loving each other. 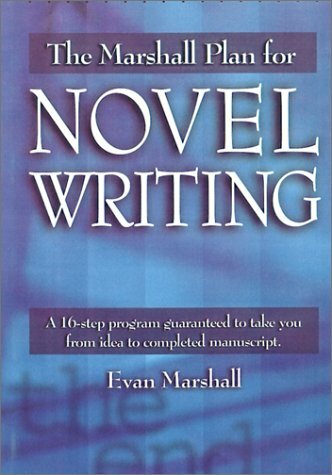 Which brings me to my review of Even Marshall's book on writing a novel, "The Marshall Plan for Novel Writing: A 16 step program guaranteed to take you from idea to completed manuscript." One thing Marshall says that I agree wholeheartedly with is "show me an unpublished writer, and I'll show you a drawer full of false starts." Um, yeah, how did you know? I am queen of starting novels, but I've only ever finished two of them. I literally have a dozen starts that are about several chapters long or so, and then... I lose interest. Or I don't know where to go next so I give up. Marshall says the best thing to do is meticulously plot out your novel ahead of time, planning each surprise and cliffhanger before you even can write "Chapter 1". Now, Marshall is not actually a fiction writer - he is an agent. He makes his living selling novels. His approach is highly practical - ie find a genre, figure out your word length, etc. Personally, I've always had a basic idea of where a I wanted a story to go, but I've never actually tried the Marshall Plan from start to finish to write anything. Those 16 steps he talks about are time consuming and difficult - but it can't hurt to give it a try. So, my goal for today is to do my character sketches for my heroine and my hero, and to start putting my plot points down on Marshall's worksheet (you can photocopy it out of his book if you don't want to buy the companion workbook). L'Shanah Toval, happy new year to my family and everyone celebrating Rosh Hashana.